Readers know what they are going to get when they pick up an unfamiliar Alice Munro collection, and yet almost every page carries a bounty of unexpected action, feeling, language, and detail. Her stories are always unique, blazing an invigorating originality out of her seemingly commonplace subjects. Each collection develops her oeuvre in increments, subtly expanding her range. My thoughts: This collection of short stories was my introduction to Alice Munro's world and writing. It is not light reading material, not ideal if you seek some fluffy escapism, but each novella will stay long with you and make you think. 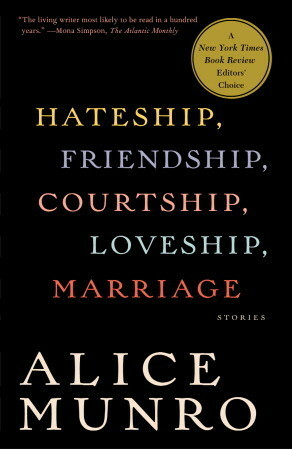 Her short stories are like snapshots of the lives of her characters, this was something that I personally don't like: I prefer a story to have a beginning, a middle and an ending, it bothered me that I didn't get a glipmse of what would happen to the characters after the middle of the story, but it is just a personal preference. I have read that Alice Munro is called the Canadian Chekhov, and I have to agree, the athmosphere of her stories is very reminiscent of Chekhov: her stories, the repressed tension, all the hidden feelings and reasons behind the peaceful exterior are simmering and make the reader tense up, feeling the progressive build up of tension and unavoidable explosion coming. This was not a light and enjoyable read but rather an unsettling drama, the storylines and problems kept me thinking long after finishing the story.